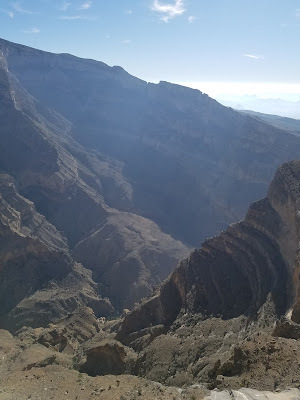 Jebel Shams (Mountain of Sun) is a mountain located in northeastern Oman north of Al Hamra town. It is the highest mountain of the Hajar range and the country, and the third highest in Arabian Peninsula. The mountain is a popular sightseeing area located 240 km (150 mi) from Muscat. In the summer, temperature is around 20 °C (68 °F)) and in the winter it drops to less than 0 °C (32 °F). Nearby is Jabal Akhdar, another prominent peak in the region. The highest point of the mountain is the North Summit, which is occupied by a military base and is a restricted area. The Ministry of Tourism, Sultanate of Oman, states the North Summit to be 3,009 m (9,872 ft)) high. The mountain also has second summit, the South Summit, which is publicly accessible for trekking via the W4 Trail, marked by the Oman Ministry of Tourism. The elevation of the second south summit is 2,997 m (9,833 ft) (Wikipedia). Here is an interesting video to witness the thrill and experience of being at the top of Jebel Shams, courtesy to The Channel.